What if? If there had been no World War II, World War I would have gone down in history as the war which devastated the Jews of Eastern Europe. The ravages of World War I on the Jewish communities of Europe have almost been completely forgotten in the wake of the Holocaust. Immediately after the outbreak of World War I, urgent pleas for help came from Jews in Eastern Europe and Palestine. In response, the Orthodox Union established the Central Committee for the Relief of Jews Suffering through the War, or, the Central Relief Committee (CRC), on October 4, 1914, three months after the outbreak of the First World War in Europe. The CRC was later joined by the newly founded American Jewish Relief Committee and the People’s Relief Committee to form the American Jewish Joint Distribution Committee. Resolved that in view of the misery, wretchedness, and hardships which these nine millions of Jews are suffering, the President of the United States be respectfully asked to designate a day on which the citizens of this country may give expression to their sympathy by contributing to the funds now being raised for the relief of the Jews in the war zones. The CRC issued press releases expressing pride at the president’s endorsement and the national, non-partisan aspect of the fundraising effort. “As the pioneer Jewish Committee for the relief of Jews suffering through the war, the Central Committee is always zealous for the good name of the Jewish Race and sought the affirmative endorsement of this work by the President of the United States which he so willingly granted. This is not the first time that a President of the United States has taken affirmative action in the face of the world’s prejudice in behalf of the Jews. But President Wilson’s Proclamation marks an epoch in Jewish affairs which will ring around the world. The aid that will come to us from the citizens of our country, without regard to race or creed, will help to succor our nine million brethren, as much through the inspiring hope of future equality in the lands of their present oppression, as will the monetary assistance aid them in food, clothing, and shelter in their present distress. As soon as the proclamation became official, the CRC, along with other relief agencies, worked tirelessly to maximize the potential of a national fundraising effort. The CRC printed 346,000 facsimile certificates of Wilson’s proclamation and issued them in denominations of one, five, ten, twenty-five, fifty and one hundred dollars to donors. Albert Lucas, Executive Secretary of the Central Relief Committee, interviewed at the World Building on Saturday night stated: “the whole of his staff had come back after the Sabbath prepared to work day and night if necessary, between now and midnight of the twenty-seventh.” A Women’s Proclamation Day Committee, chaired by Mrs. Rose Elkeles, was established. In addition to the facsimile certificates, the women planned to go around the city, especially through the financial and insurance districts, in automobiles, accompanied by 800 Boy Scouts in uniform, and distribute dime pocket banks and small golden Mezuzahs, as part of the fundraising effort. CRC press releases also emphasized that the governors of many states, and the mayors of many cities, issued proclamations of support for Jewish Relief Day. In addition, the press releases cited the efforts of Christian clergy on behalf of Jewish Relief Day. Copies of the facsimile certificates were printed in almost every newspaper across the country. 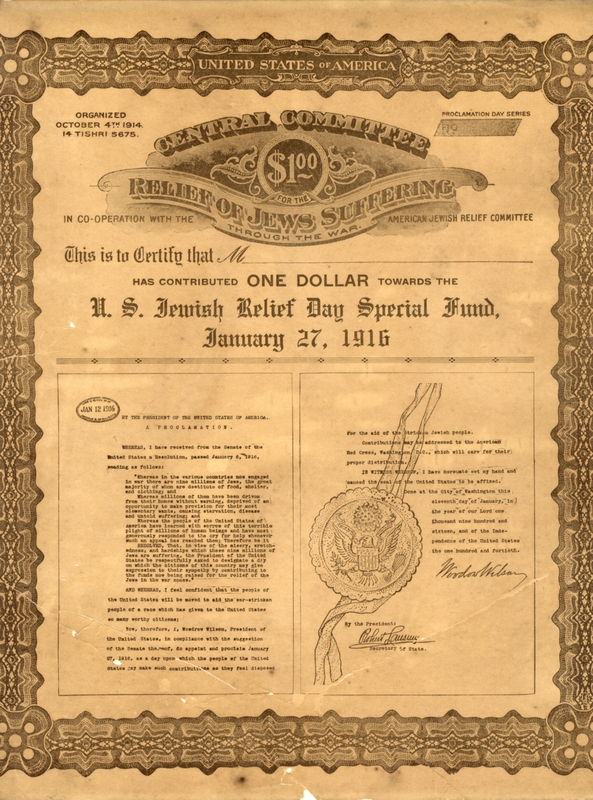 Two million dollars were raised on Jewish Relief Day, making the drive the most successful fundraising effort ever conducted by an American Jewish organization. 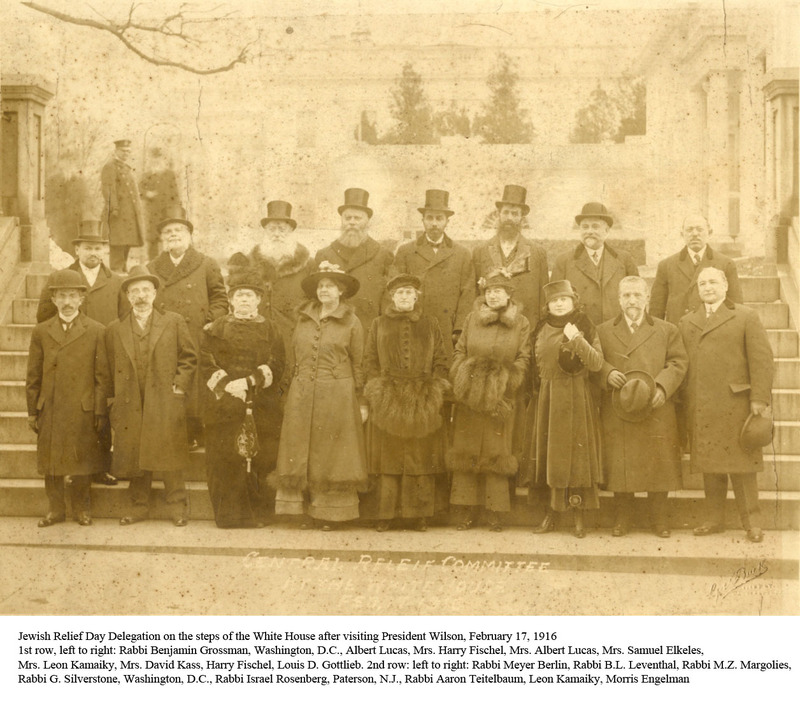 On February 17, 1916, representatives of the Central Committee and the Woman’s Proclamation Committee visited the White House and were received with great courtesy by President Wilson, who graciously accepted an illuminated copy of a certificate commemorating Jewish Relief Day. 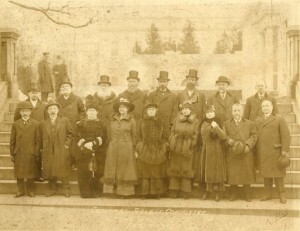 According to Harry Fischel’s biography, when the President accepted the gift, he stated that he “deemed it a great privilege to have been afforded the opportunity of lending his assistance in such a worthy humanitarian cause.” A now historic photograph of the delegation was taken on the steps of the White House before the group departed. 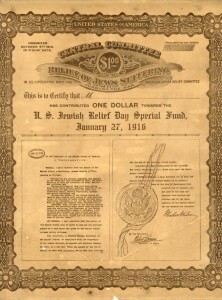 Jewish Relief Day was declared by President Wilson while the United States was a neutral party in the conflict. The United States entered World War I a little over a year later, on April 6, 1917, on the side of the Allies. World War I finally ended on November 11, 1918. The CRC continued its work, aiding Jews in Eastern Europe in both material and spiritual ways, until World War II. 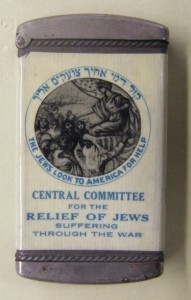 The Central Relief Committee Collection, including many of the documents and artifacts mentioned here, is available to researchers at the Yeshiva University Archives.